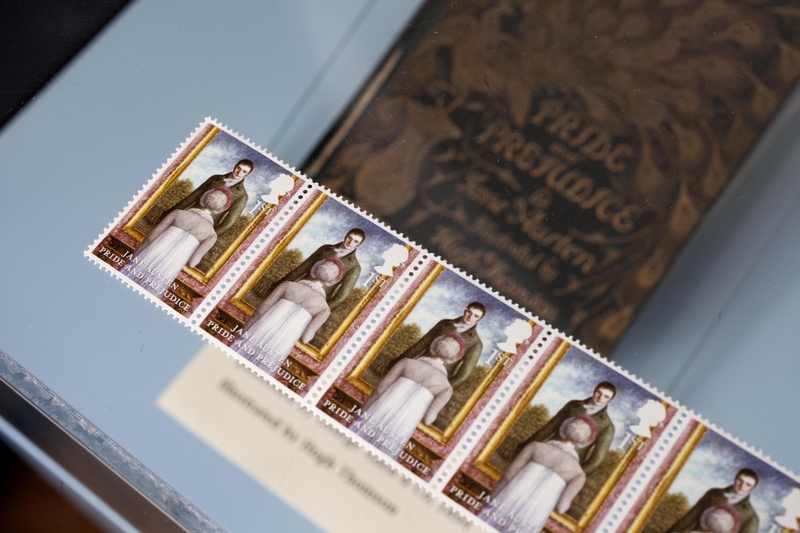 England's Royal Mail unveils Jane Austen stamps 200 years after "Pride and Prejudice"
HAMPSHIRE, England One of literature's most beloved couples - Elizabeth Bennet and Mr. Darcy from "Pride and Prejudice" - are featured on a new English stamp. The stamp was unveiled in England today to mark the 200th anniversary of "Pride and Prejudice." Jane Austen's other novels, "Sense and Sensibility," "Mansfield Park," "Emma," "Northanger Abbey" and "Persuasion" make up the six-stamp set. The Royal Mail announced that letters posted in Chawton, Hampshire, where Austen lived, and Steventon, near Basingstroke, where she was born, will have a special postmark for one week. The postmark? A famous Austen quote from Pride and Prejudice: "Do anything rather than marry without affection." Royal Mail stamps spokesman Andrew Hammond said: "When you think of great British authors, Jane Austen inevitably comes to mind. Her novels have contributed immeasurably to British culture over the last two centuries." Illustrator Angela Barrett was commissioned to complete the artwork. First published in 1813, "Pride and Prejudice" remains Jane Austen's most-read novel. Over the years it has been adapted into film and television, including the BBC's popular 1995 version starring Colin Firth as Mr. Darcy. It has also inspired countless novels and films, such as "Bridget Jones's Diary."